The cover art for "Dorian Reeds (for Brass)" shows Matt Starling's flugelhorn overlapped by a grainier version of itself, followed by increasingly pixelated iterations until the horn is a jumble of cyan, magenta, yellow and black polka dots. Ryan Fedor—former Tolchock Trio guitarist and Starling's bandmate in the Salt Lake ElectricEnsemble—designed the booklet. Intending a simple, clean, bold and modern design, Fedor took his cues from the 20th-century modern, avant-garde and classical record covers of the '50s and '60s, which often used famous pieces from designers and artists like Kandinsky, Mondrian and Josef Albers. Fedor also incorporates the pop art, half-tone look popularized by artists like Roy Lichtenstein and Andy Warhol, as well as '60s psychedelia. The style seemed appropriate, Fedor says, because it's inspired by the era from which Terry Riley's original version of "Dorian Reeds" surfaced, and conveys what's happening musically in the piece. "Repetition, repetition, repetition, with slight variation. Slow movement and change over a period of time," Fedor says. "'Showing' minimalism perhaps, rather than actually being minimalist." 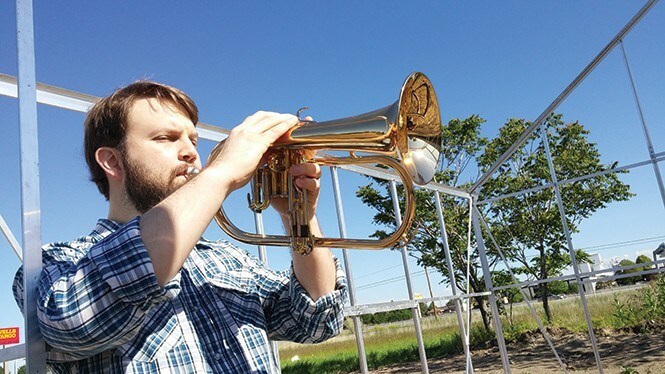 Fedor featured the flugelhorn—photographed by his wife, Chris—in order to call attention to Starling's twist on the piece: Namely, that Riley originally performed on soprano saxophone, a reed instrument, while Starling's horn is reed-less brass. The inclusion of a note transcription is a poke at the old CD booklet trope: lyrics. Fedor delivers the punchline: "There aren't any!" Follow Fedor on Instagram accounts "iii__o__o__iii" (for photography) and "albacoretuner," a personal account where he occasionally posts designs, drawings and other art. One man! One flugelhorn! Two tape recorders! You hooked yet? Let's make it sexier by adding software. How about another man? And an exotic locale! Matt Starling is the first guy—the one with the horn. The second guy is minimalist composer Terry Riley, who wrote the 1964 piece "Dorian Reeds." Starling, a music teacher at East Hollywood High School in West Valley City, has recorded his own version of the piece—"Dorian Reeds (for Brass)"—to fulfill requirements for a master's of music technology from Indiana University-Purdue University, which he attends online. Starling is the founder of the Salt Lake Electric Ensemble and member of the Salt Lake Alternative Jazz Orchestra. Both entities have reputations for playing some of the most innovative jazz music in the state. "Dorian Reeds" is another such project—a mesmerizing listen from the first measures. In his liner notes, Starling writes, "[In] Terry Riley's score for solo performer and two tape recorders, the performer interacts with layers of music which were recorded in the past. The score is filled with modules of music meant to be repeated by the performer against a constantly mutating tape loop." In the original piece, Riley played soprano saxophone into one tape recorder. The tape from that machine then traveled to another, which was positioned far enough away that five quarter-notes would pass before the signal arrived. The tape then traveled back into the original machine, where the live signal—Riley continuing to play—was recorded and mixed with the previously recorded music. "The system created many layers of sound," Starling writes, "with the older moments, like memories, slowly fading away." Starling took his flugelhorn (which sounds like a fatter, darker trumpet) and minimal gear to João Pessoa in Brazil, where he holed up in a bedroom to record "Dorian Reeds"—piecemeal—over and over again. At home, he says, "I listened to all the performances and used the 10 percent I liked the best to construct the piece." Using Ableton Live software and Waves plug-ins, Starling placed sections of the piece at different points on the sequencer timeline in order to achieve the same effects as Riley did with tape machines. "Dorian Reeds" starts with four notes—E-G-F#-E—repeated 28 times, according to Starling's transcription in the booklet. The notes seem to come faster, and take on an urgency—but that may be when the loop kicks in. It's hard to tell. As the piece progresses and Starling plays new phrases and they pass each other in this sonic stream, the urgency wanes. You begin to notice things—for example at 3:42, how the horn takes on the sound of a stringed instrument. At 8:28, some notes merge into a drone that persists for the duration of the piece. Throughout the performance, the mood of the music goes from mellow, to bright, to melancholy and back to urgent—and then keeps changing. And then, notice your eyes are open but you see nothing. You've forgotten the music is even playing. You've warped ahead to 38:18. Whuh? Is that a bassoon? The urgency is back and building. The drone is higher-pitched and out in front of those faded memories Starling mentioned. Finally, everything fades out. "The intense repetition of it, along with sort of the gradual change," Starling says, "I definitely find it very hypnotic and easy to disappear into. It's one of those pieces where time stops, in a way, if you give yourself over to the music." Which you should do. With headphones. Also, check out Starling's Bandcamp page (MattStarling.Bandcamp.com), where you can stream "Dorian Reeds (for Brass)" and buy it digitally, on CD or on hi-res audiophile DVD-Audio or Blu-ray. You can also hear or buy SLEE's performances of Riley's "In C" or Karlheinz Stockhausen's "Set Sail for the Sun," as well as Starling's debut ambient track, "Origin."